How Cambodia is rolling out the digital red carpet to welcome Chinese tourists. By Andrew Barnes, freelance journalist, Photo credit: Brandon Roberts. It’s a typically sweltering summer’s day in Phnom Penh. The July sun is beating down mercilessly on Cambodia’s bustling capital city but on the horizon, towering thunderclouds are gathering, promising some brief yet dramatic relief in the form of a monsoonal downpour. The languid lunch hours over, the food carts are being wheeled to their next strategic location and locals and visitors alike are sipping chilled beers as they gaze across Riverside onto the Tonlé Sap River and across to the mighty Mekong. 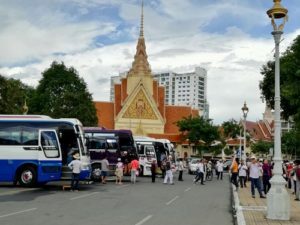 Over at the Royal Palace, the gates are about to open for the afternoon visiting session and, just as they are at Cambodia’s other major tourist hotspots, Chinese tourists by the busload are pulling up, complete with their umbrellas and selfie-sticks. Chinese Tourists arriving at the Royal Palace. Palace in China. We have seen the one in Bangkok but this one is more beautiful.” They also said they had been made to feel very welcome: “Everyone has been so helpful and our hotel manager even speaks Mandarin and Cantonese, so it has been very easy to get information about where to eat and where to shop. We love shopping and the prices here are so cheap!”. Michelle Han has also been enjoying her time in the country. A businesswoman from Shanghai, she’s been mixing business with pleasure: “My company is looking to expand here so I have been conducting a site visit, but took some time from my schedule to join this tour. The palace looks so beautiful and I cannot wait to get inside. Everything here has been such a pleasant surprise, especially the food which is very tasty but not too spicy.” Part of that “pleasant surprise” has been feeling more at home in Cambodia, by being able to enjoy the same level of convenience they’re used to at home when the time comes to pay for their hotel stay or buy souvenirs, because, as it happens, the Chinese are not all that fond of cash. Their country is on track to become the world’s first truly cashless society. Its home-grown Alipay overtook PayPal as the world’s largest mobile payment platform in 2013. It was founded in 2004 by Alibaba Group founder, Jack Ma. Headquartered in Shanghai, it is said to handle well over 50% of all cashless payments in China. Accounting for most of the remaining payments is WeChat Pay, another Chinese favourite. Part of WeChat, known in China as “the app for everything”, WeChat Pay is one of the most widely used mobile wallet apps in the country with over half a billion users. Not surprising then, that when they travel, up to 90% of Chinese prefer not to do so with cash. They simply don’t have to. Many international tourists wrongly assume Cambodia isn’t up to speed when it comes to cashless payments. Most bars and restaurants in Phnom Penh’s tourist hub of Riverside and even along the more chic stretch of Bassac Lane still don’t accept credit cards, but a rapidly growing number of them are offering a truly 21st Century alternative: payments via mobile phone. It’s a level of sophistication and convenience which our friends from China are delighted to find they can now enjoy while on a holiday in Cambodia. The kingdom’s mobile payment service providers are working hard to make Cambodia both a cashless society and a cashless destination. 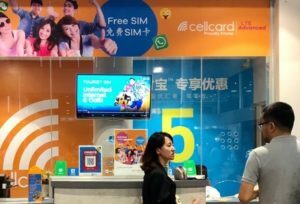 Just talk to Cambodia’s biggest mobile banking service provider, Wing, which is focusing on an “Arrivals to Departure” strategy to make it as easy as possible for China’s tourists to use their favourite payment methods from the moment they land at the airport to when they’re buying their duty free goods to take home. 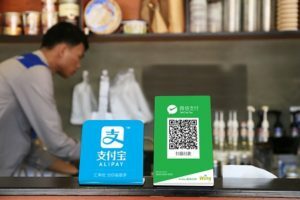 It’s already working with both Alipay and WeChat Pay, extending the range of its mobile phone-based products and services, which include local and overseas money transfers, bill payments, phone top-up, WingPay online and offline payments at over 20,000 merchant partners, as well as an Online MasterCard. Wing handled millions of transactions in 2017 and that’s only going to grow, thanks in part to the welcome increase in Chinese tourists. Wing CEO, Jojo Malolos, says he’s keen to make sure that travellers from China and other parts of the world are able to enjoy a hassle-free visit, adding that “we want these visitors to feel that Cambodia is a home away from home.” By working with Alipay and WeChat Pay, Wing says the growing number of its current WingPay merchants who’ve been enabled to accept Alipay and WeChat Pay couldn’t be happier with the extra business that is coming in. Another of those merchants is Phnom Penh’s Hotel Cambodiana, which is now offering Alipay and WeChat Pay as methods of payment. The hotel’s Director of Sales and Marketing, Marion Satumbaga, says their Chinese guests “feel even more welcome being able to pay using one of their most popular payment gateways.” It’s a sentiment echoed by those pouring into the Royal Palace, barely a kilometre up the road. Cambodia is becoming an increasingly popular choice for Chinese travellers. You just have to look at the annual statistics. According to the Cambodian Ministry of Tourism, China overtook Vietnam last year as the number one country of origin for international tourists to the kingdom. Year-on-year, the growth in numbers is nothing short of staggering. In 2017, 1.2-million Chinese visited Cambodia. In just the first four months of this year, we’ve already climbed to over half of that figure. Between January and May 2018, 647 000 arrivals were registered from China. That represents mind-boggling growth of 79%. No small wonder then that the “Kingdom of Wonder” is working hard to cash in on its popularity. It’s called the “China Ready” strategy and aims to attract two million Chinese tourists here by 2020. That might seem like a very big number, but with 79% growth already in the first few months of this year, it is very likely that this target will be met. It all bodes remarkably well for Cambodia and the Chinese tourists like Jial, who are literally queuing up to come here, or anywhere, for that matter. An increasing number of destinations are opening up for its citizens and overseas travel is becoming a major lifestyle trend. The World Tourism Organisation estimates that within the next 18 months, over 200 million Chinese will be heading overseas on holiday. 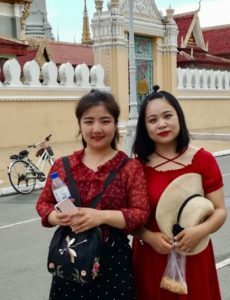 Cambodia is hoping to grab a highly realistic 2% slice of that pie and the work that the likes of Wing is doing will only help to bring even more Chinese tourists here in the years that follow.